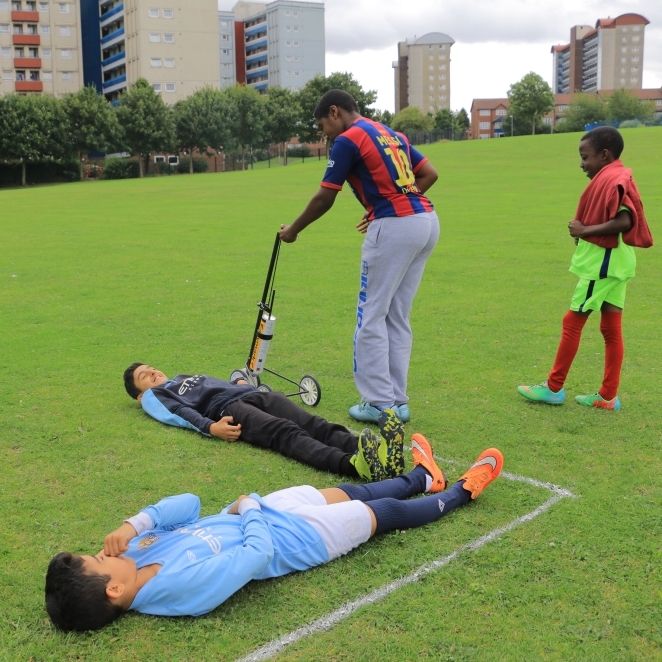 Play Ball/Draw Your Own Pitch is a playful, public, football-pitch-creating one-day event. 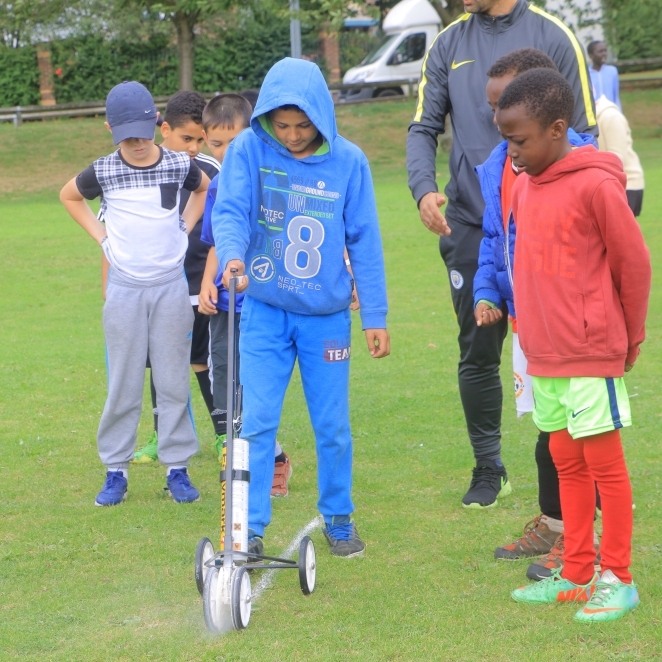 Part pop-up, part flash mob, part crop circle, it’s a simple way for a group of people to create a proper football pitch on an available area of public land in the vicinity of a residential community. 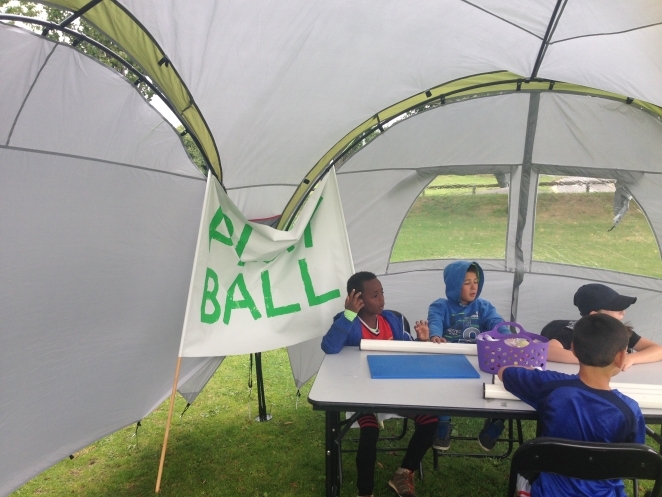 Play Ball aims to activate otherwise underused public sites that can – and arguably should – be available to be used by local communities. 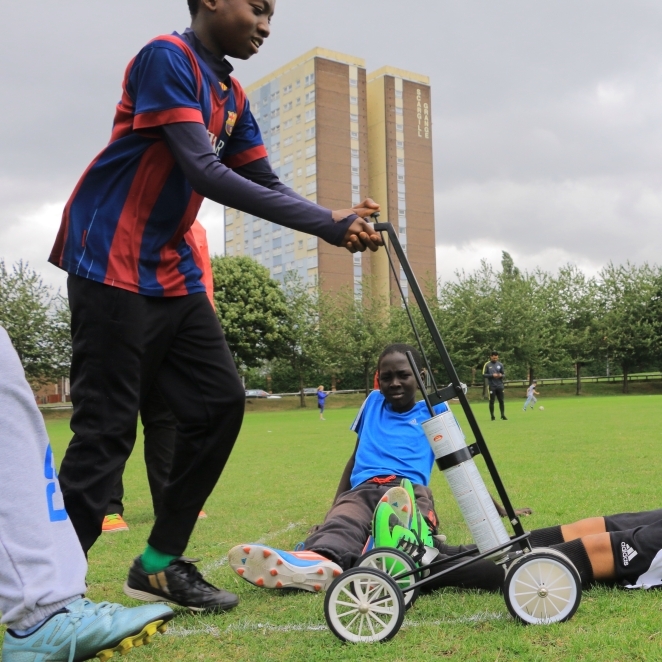 It intends to spark conversations at regional and national levels about how public land can be better used and accessed by everyone, especially to play games and sports. 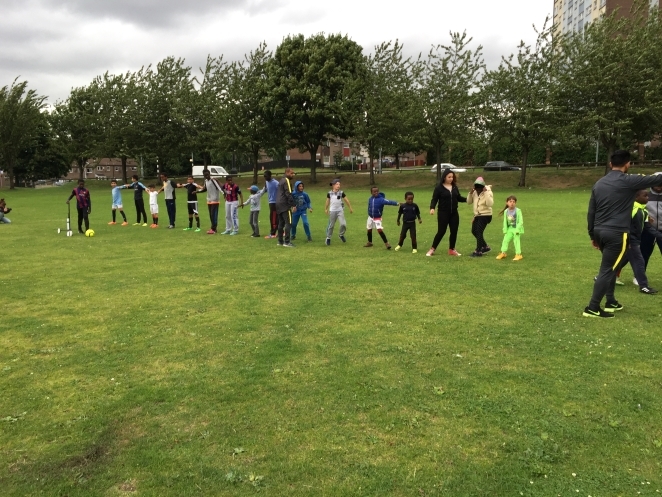 We tested out the idea in Burmantofts in Leeds in collaboration with the Street Work Soccer programme on the field in the centre of this inner city estate. It was co-commissioned by East Street Arts, as part of the EX(S)PORTS programme and supported by the National Football Museum. 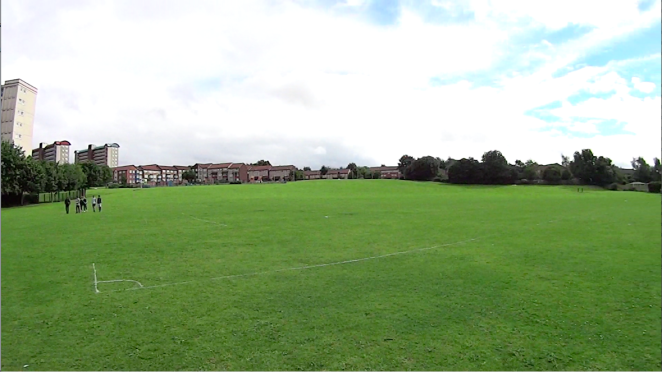 The field where the pitch was made was a relatively well-kept grassy area, as Leeds council’s parks team look after it. It’s also overlooked by some tower blocks and a small playground. 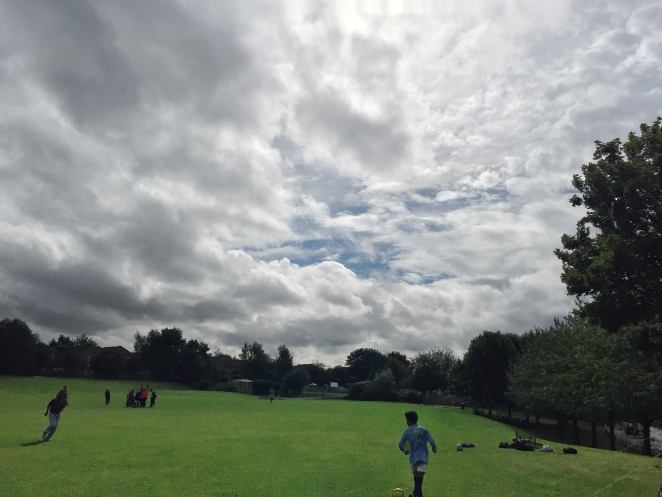 Pop up football games happen quite regularly – but there was an appetite for staking a claim on the land for more play to happen there. 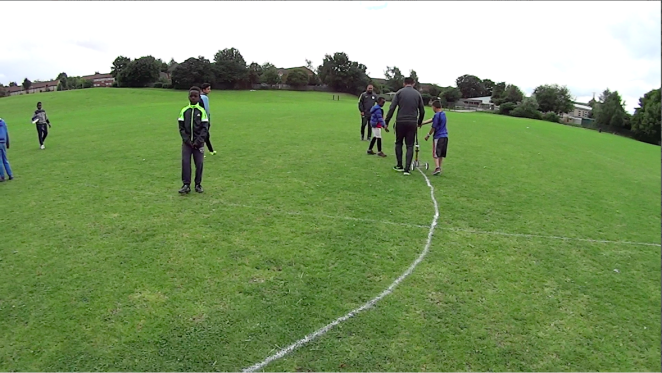 Taking inspiration from the “two jumpers to mark the goal” convenience of the most basic temporary pitch, we created the pitch boundary using everyday items laid end to end on the underused site. Local residents were invited to bring personal articles, such as household objects or pieces of clothing, either significant or very ordinary, to create this communal boundary. Once the boundary has been laid out, we mowed the grass inside the edges to create a playable surface before making the playlines of the pitch. 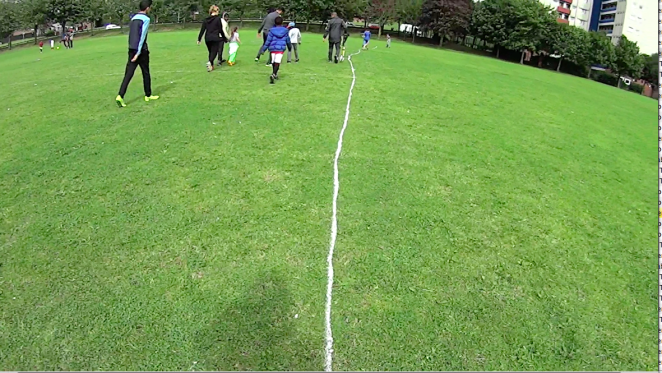 Then a line painter was used to draw in the lines, finalising our functioning football pitch. Then we played. 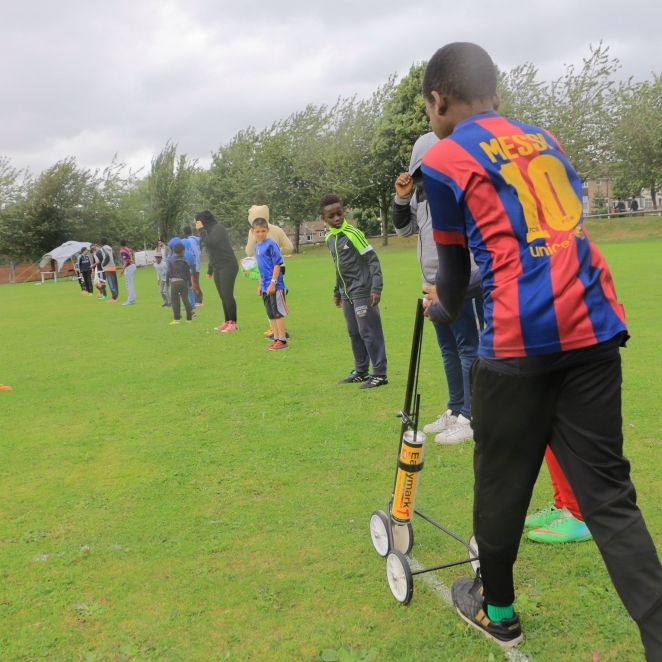 We worked with professional football players and local and national decision-makers to raise the profile of the event, making visible the issues surrounding public use of unused land in community. As the project continues, we hope there’ll be space for feedback, discussion, the sharing of other pop-up-pitch ideas and images of unusual pitches plus, potentially, other examples of temporary uses of space. There is no rule in football that sets an exact size for the pitch – though there are guidelines and a maximum and minimum size. 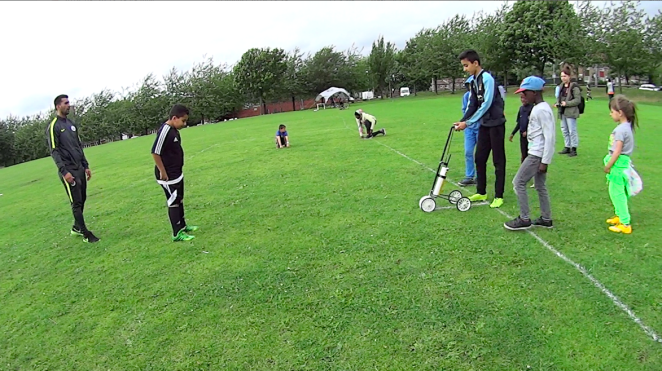 This means we can make a legal football pitch in many different sized spaces. So even though the size of this pitch will be determined by the number of things brought along on the day, we can be sure it will still be a pitch that conforms with the rules of the game. The project was inspired by two things. 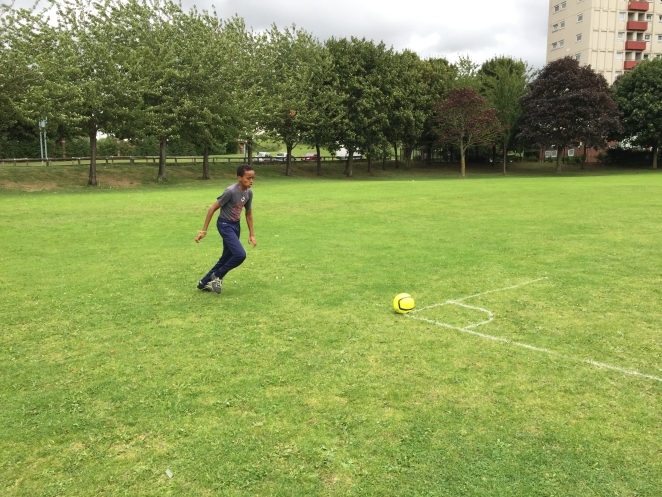 Firstly, when Wunderbar worked in Cowgate, Tyne and Wear, in 2012, we talked about football pitches with the youth group we were working with – specifically that they didn’t have one on the estate. Other estates nearby had pitches but not them. They felt this was unfair. At the time, we had been asked by the council to help make the Cowgate Community Centre more appealing. The centre is located on the site of a former school. Most of the buildings have been demolished, leaving large areas of land – both tarmac and grass – that are enclosed by a high metal fence. The fencing isn’t there for any obvious reason – there are no explanatory signs – but it is clearly out of bounds to the community. Cowgate is an area that attracts a negative view, both externally from the city, and internally from its own residents. We found this fencing off added to the depressed attitude of the youth we worked with on site, in particular in respect of their prospects: “If you are from Cowgate, no good will come of you.” We observed this despondency was one of a number of examples of the young people feeling disempowered. Secondly, this recent report by Sport England states there are a distinct lack of football facilities in Newcastle for local residents to play. This contradicts planned legacies from major sporting events such as the Olympic Football at St James Park in 2012, and the 2015 Rugby World Cup, as well as the fact that so many devoted fans put Newcastle United at the centre of their social lives. 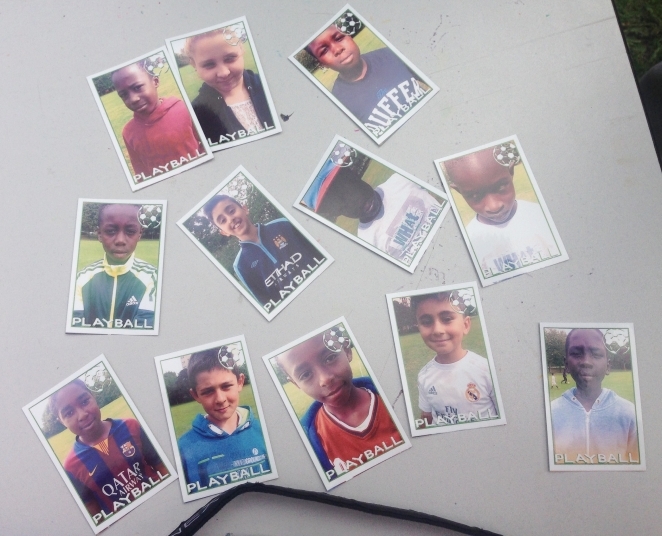 Play Ball is inspired by our experiences in Newcastle, but highlights issues that are much wider than our home city. “No Ball Games” is a familiar sign in UK cities; much city space that purports to be public, or to allow public use is, in fact, privately owned, and there are rules as to what behaviour is acceptable. This oftentimes precludes youth activities such as game play. These are well documented. Rather than being seen as a space with potential for those who live in the area, these spaces become forbidden, empty spaces, even potential battlegrounds, that signify the disempowerment of a community. Many things have changed since 2012, not least that Newcastle City Council no longer runs the community centre in Cowgate, but have handed it over to a local charity. It’s one of numerous measures the council have taken in the wake of extreme cuts to funds – cuts that are replicated in many places nationwide. There are also many examples of community groups taking over previously council owned buildings and underused or disused space – and schemes to help communities to do this. We’re also interested in the many schemes that invite artists to use spaces under what’s called ‘meanwhile’ use. This is the time that elapses while the private developers who own the land wait for all the financial elements to fall into place before they do their developments. The artists have “creative capital” and through their ‘coolness’ and ‘cache’, enhance the profile of an area, which in turn raises the value of the financial capital. Artists often complain about this, because their work, that they’ve done for for very little monetary reward, ultimately results in them pricing themselves out of the area they inhabit. In some ways, it is worth complaining about. But we wonder – is it possible to raise the breadth of people holding creative capital beyond those in the arts sector? Can we better share what artists do with those who feel truly disempowered by people that appear to hold all the power – be that politicians or the wealthy landowners – so that there can be some rebalancing of power? We’d like to try. And why shouldn’t you if the space is there? 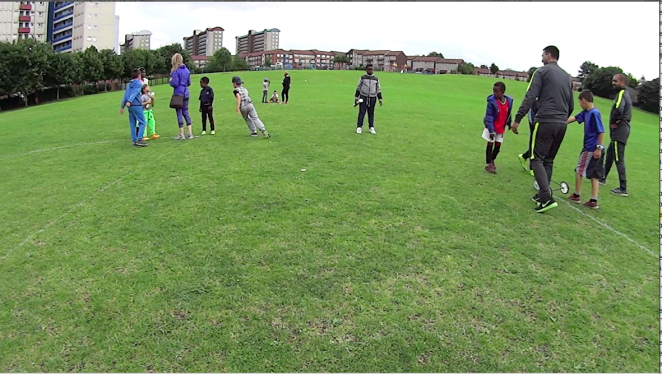 With Play Ball we hope to playfully engage in a debate about more positive and active attitude towards underused public space. And alongside this, to hopefully encourage more positive attitudes in the groups of people we engage. Play Ball is an experiment. It might sound like we have lofty ideals. To some extent we do. We’d like the world to be a fairer place. We also think it would be a lot of fun to get hold of a drone camera so we can take overhead photos. But mostly we hope to meet some interesting people, have good conversations, and play some ball.